We had a wonderful turn-out yesterday for our 28th Annual Creek Cleaning. With the 106 people who signed in and a few who did not, we had a little over 110 participants..
We knew from the Austin Parks Foundation’s website that we could expect a lot of help, so the Parks Committee pre-selected locations and crew leaders and it worked out beautifully. We were able to clean out trash from both East and West Bouldin Creek and the West Bouldin Creek Greenbelt, in addition to weeding beds in Nicholas Dawson Park. We have not been able to do such a thorough cleaning in a couple of years. It was cold and damp but that did not prevent anyone form having a good time. When we were done, we enjoyed tacos donated by El Mercado; this is the 28th year they have fed our volunteers. Please be sure to thank them next time you are there. And do go out and explore the parks and the greenbelt. Everything is budding and starting to bloom. And – there is that new species recently discovered in Nicholas Dawson Park, a tree-dwelling blue whale. I think it is the only one of its kind. Our 28th Annual Creek Cleaning will happen this Saturday, weather permitting. We have had record participation registrations from members of the greater Austin community, so we have closed registration at the Austin Parks Foundation site. HOWEVER, this is a neighborhood tradition and we would like to encourage you to join us and explore our creeks and greenbelts. We will have enough people to clean both creeks and also do some maintenance (weeding, etc.) in N Dawson Park. If you are interested in the latter, please bring some gardening tools. Please wear sturdy boots, long pants, long-sleeved shirts to guard against exposure to poison ivy. Gloves, tools and trash bags will be provide courtesy of the Austin Parks Foundation. Since 1991, neighbors and community members have met once a year to collect trash in both East and West Bouldin Creek. Together we have removed enough car parts and tires to build a small fleet of cards, carpets and appliances to furnish several homes, cans and bottles to open a convenience store and styrofoam to last quite a few lifetimes. In addition, innumerable pieces of found art made it home with their proud finders. We’ll meet at 8:30 am at the entrance to Nicholas Dawson Park on the corner of Gibson and South First for coffee and snacks provided by neighborhood restaurants, then send teams of people to different parts of the two creeks. Around 11:30 am we meet back in N. Dawson Park for lunch, again courtesy of our business friends. Hot off the press is the February-March Bouldin Bulletin. The same good stuff you might have read while drinking a cup of coffee —but in digital form. The Bouldin Creek Neighborhood Plan Contact Team (BCNPCT) will hold its annual meeting Saturday, February 9 at the High Road, 700 Dawson Rd., at 4:30 PM. As a bit of background: -Neighborhood plan contact teams are separate from neighborhood associations. -Their sole purview is stewardship of the neighborhood plan. -They operate under city-dictated bylaws, elections, meetings, notification, and reporting. -All BCNPCT meetings are open to the public and anyone who resides in or owns a business or property in the neighborhood plan area may participate on the contact team. The Bouldin Creek Neighborhood Plan has been amended several times since its 2002 adoption. Amendment requires city application and notification. No amendments are scheduled for this meeting. BCNA Meeting Schedules: BCNA General Association Meeting: 2ndTuesday, every other month BCNA Steering Committee Meeting: 1st Monday, each month BCNA Zoning Committee Meeting: 3rd Monday each month Meetings at The High Road, 6:45pm 700 Dawson Road. Unless otherwise noted. A little Austin history from John T. Davis. A cool article about Austin. Longtime Austinites are particularly fond of their former sleepy college town’s history, and no decade represents a happier time—the happiest, some would say—than the freewheeling, youth-driven ’70s. 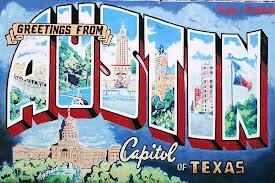 Austin has always been a progressive city, but this decade formed the bedrock for where we are today. We explain why. Thank you to everyone who attended the West Bouldin Creek Greenbelt Open House on Saturday, November 3. We had a very good turn out – about 40 people, including several Zilker residents, explored the trails, looked at the new signage and got updates on future plans to improve the Post Oak Street Trailhead. Many thanks to those of you who helped clear the trails and pick up trash before the event and especially the BCNA Parks Committee members who created and installed our temporary signage. 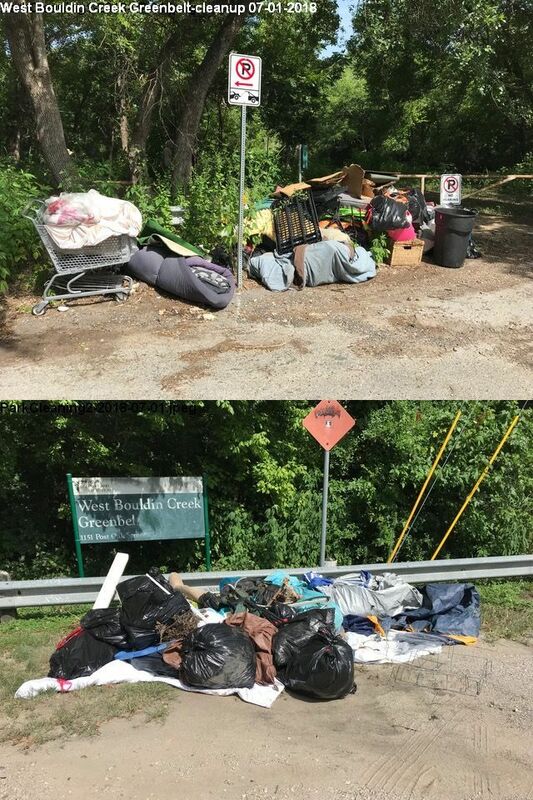 13 Bouldin residents met in the greenbelt this morning and collectively removed 6-8 large homeless camps: tents, mattresses, sleeping bags, clothing, styrofoam and plastic containers, toiletries, cans, card board – most of which had been there since our last creek cleaning at the beginning of March. It was dirty, sweaty work and we had to haul everything well over half a mile to get it to one of the two entrances. PARD has been notified and will pick up the piles, hopefully by tomorrow. After 2 hours in the heat, we ran out of steam. There are still some card board camps along the railroad tracks and we will most likely schedule another morning in about two weeks to get the rest. If you missed this one, come join us! We are also discussing strategies to prevent the situation from getting as bad as it was today. Part of the problem is that Park Rangers hand out eviction notices, but the camp occupants will come back a few days later or others will move in. The only true deterrent seems to be to remove the camps immediately, and PARD lacks the resources to do that. I have asked them for referrals to community groups that can help out and will also reach out to Keep Austin Beautiful and the Austin Parks Foundation. We want the greenbelt to be a safe place for residents to enjoy and we know that the more people do, the less camps we’ll have. For now, please thank Ben, Danny, Gary, Matt, Michael/ Stacy/Cash, Ronnie, Thom, Kate, and especially Scott & Liz who just bought a house in Bouldin and have not even finished moving in.